Atlantis may steal the mythical city spotlight, but unlike that enigma these places once thought to be fiction turned out to be all fact. The modern city of Dwarka (meaning ‘Gateway to Heaven’ in Sanskrit) is located in the north-western Indian state of Gujarat. This city is regarded as one of the most prominent Chardham (the four sacred pilgrimage sites of Hinduism), and one of the seven most ancient religious sites in the country. According to Hindu mythology, Dvārakā was a city where Krishna, the eighth avatar of Vishnu, once lived. Dvārakā is purported to have been thoroughly planned. 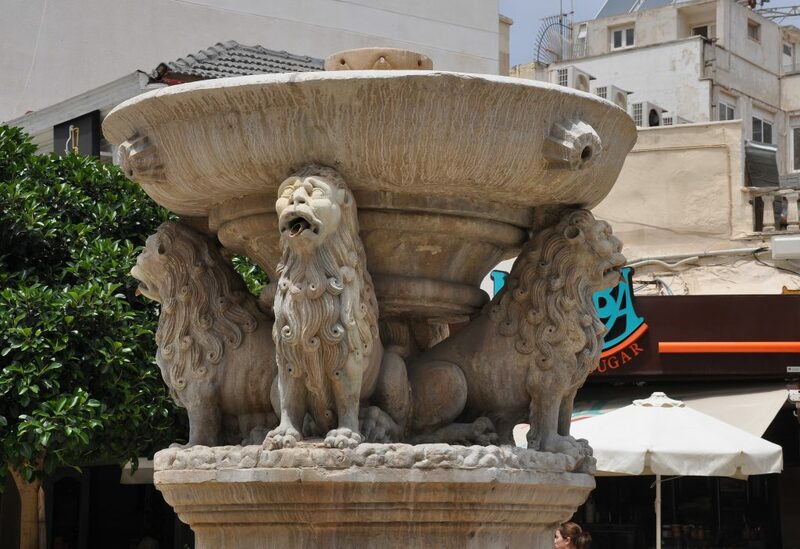 The city is said to have been divided into six sectors which contained residential and commercial areas, wide roads, plazas, palaces (700,000 that were made of gold, silver and precious stones), as well as numerous public facilities, including beautiful gardens and lakes. A hall called the sudharma sabha (‘Meeting of True Religion’) was the place where public meetings were held. As the city was surrounded by water, it was connected to the mainland via bridges and a port. Krishna lived for the rest of his life in this newly-built city. Nonetheless, after being accidentally shot by an arrow whilst meditating under a tree in a forest at Bhalka Tirtha, Krishna departed from this world. 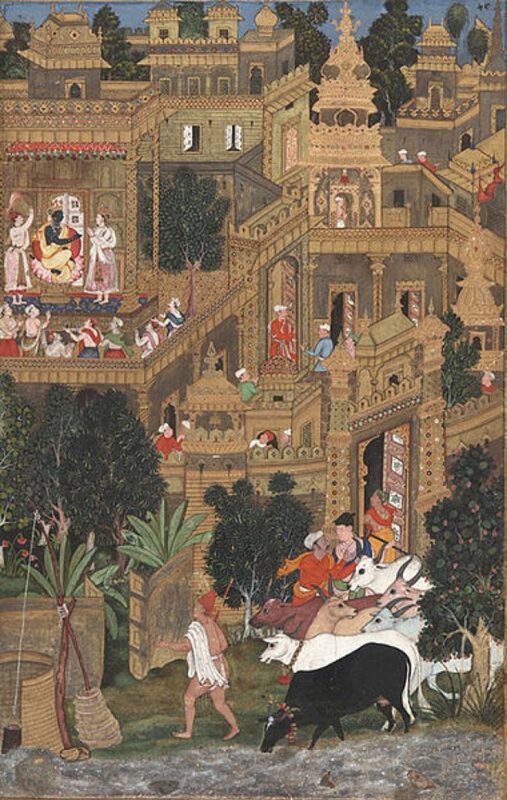 After Krishna’s death, the city he founded was swallowed up by a massive flood, thus returning it to the ocean. It is said that over the centuries, a number of civilizations built their cities in the area where the city of Dvārakā once stood. The present city of Dwarka is believed to be the seventh one that was built there. Dvārakā and its fate have been dismissed by some as merely a myth. 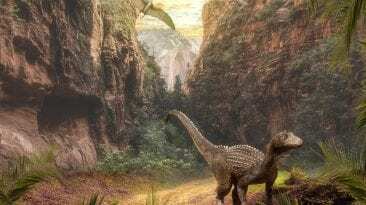 Nevertheless, there are also those who fervently believe that there is a historical basis for this story. There have been archaeological excavations conducted in front of the modern city’s famous Dwarkadhish temple (the current structure is dated to the 16th century AD). 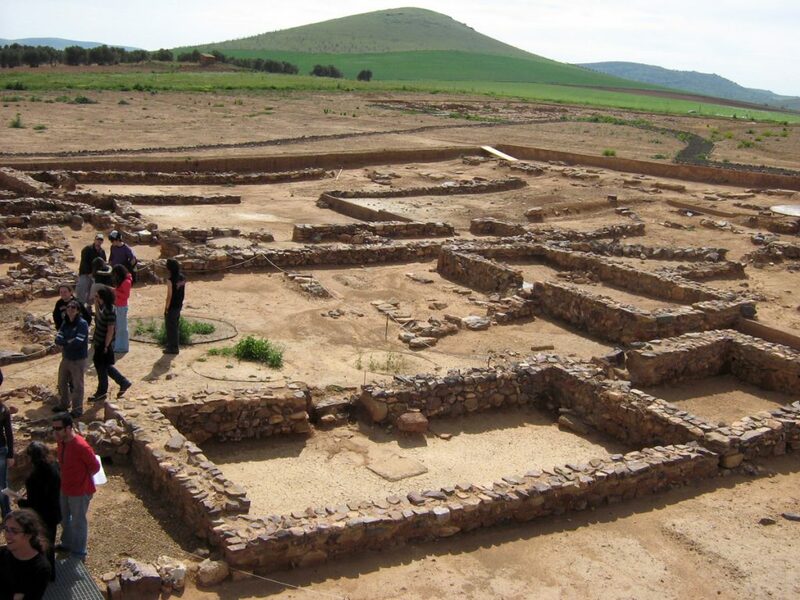 Results from these excavations suggest that there is evidence for a destroyed proto-historic settlement dating all the way back to the 15th century BC. Such a discovery gave impetus to archaeologists to conduct offshore investigations. The results of the underwater archaeological research show that there are indeed structures submerged just off the shore of the modern city as well. These include stone anchors of various shapes and sizes, dressed stone blocks that were used for construction and fortification walls of an ancient city. It has been speculated that these underwater structures also date to the 15 th century BC. 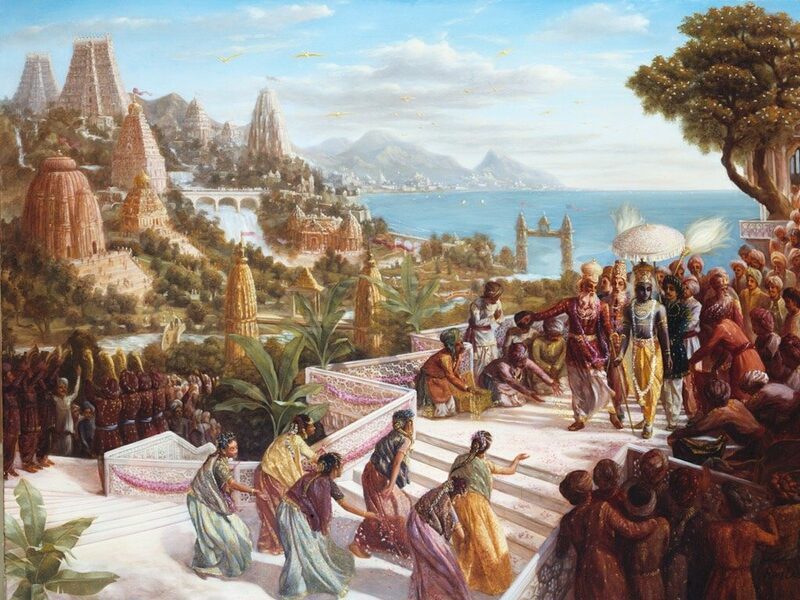 Thus, it is entirely possible that the mythological city of Dvārakā founded by Krishna has its historical basis in this proto-historic settlement that was submerged under the waters. Popular opinion was that the place had to be mythical Ophir, from whence the Queen of Sheba got the gold she gave to King Solomon, as chronicled in the Bible. 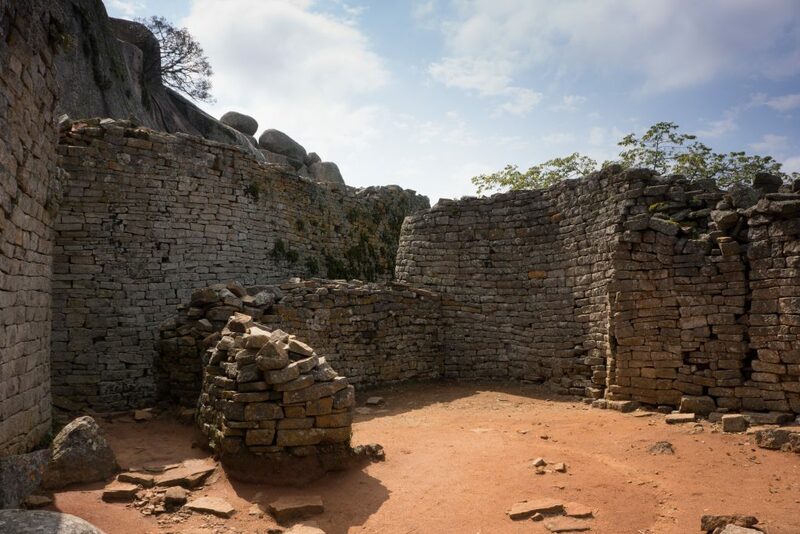 In 1871, a German man seeking Ophir was led to place the locals called Great Zimbabwe. At the time of discovery, everyone assumed they had found the relic of a once-great civilization of white men, who had brought materials from far away to build the city. 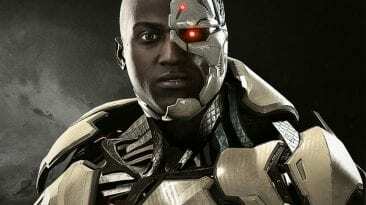 Later “archaeologists” were so hell bent on finding evidence that proved white builders were responsible, they discarded all the relics that were clearly of indigenous origin. Which were, of course, all of them. 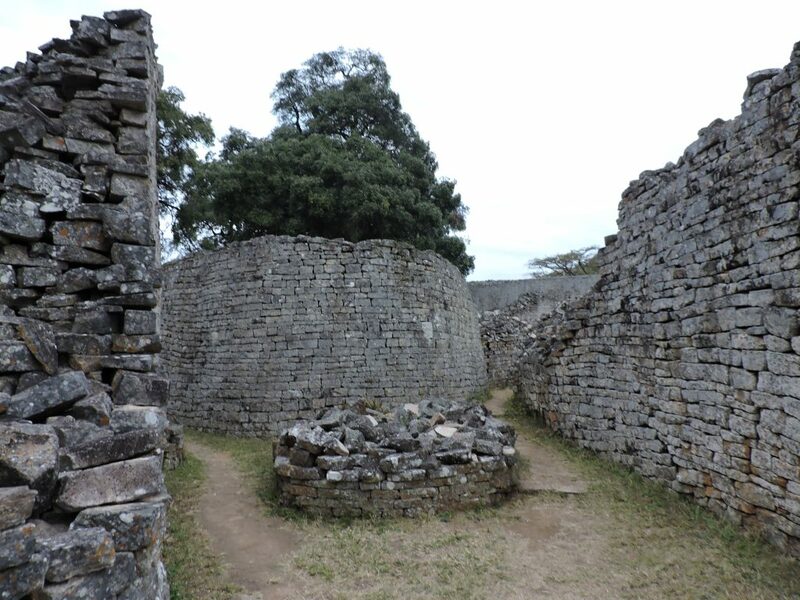 Great Zimbabwe was a city, an African city home in its heyday to some 12,000 to 20,000 people. While few traces of the mud houses remain, the towering stone walls that still stand leave little doubt that the culture who build them was a force to be reckoned with. The granite to build them came from nearby, and the pieces were fit so well together that they have withstood the test of time with no mortar, and were made as smooth as any brick wall built today. Shortly after the city was discovered by Europeans, the country where it lies was named Rhodesia, after the British industrialist Cecil Rhodes. After gaining independence from the British, the nation was renamed Zimbabwe. 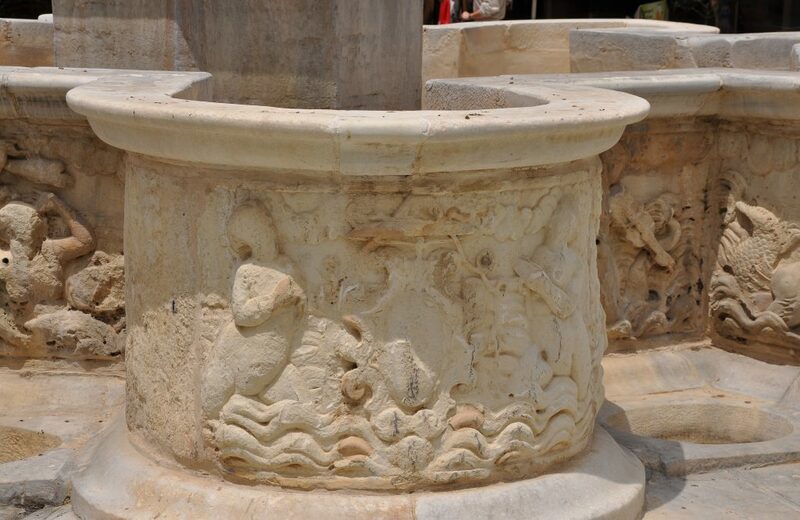 Picture a great ancient Greek city, lost to the ages after being consumed by the sea. Sure, we could be talking about Atlantis, but we could also mean Helike, the other city lost under the waves. For a long time both cities were assumed to be mythical, but there were just too many written accounts of Helike for modern archaologists to accept that. Using clues in these writings to figure out its location, the ruins of Helike were discovered in 2001. 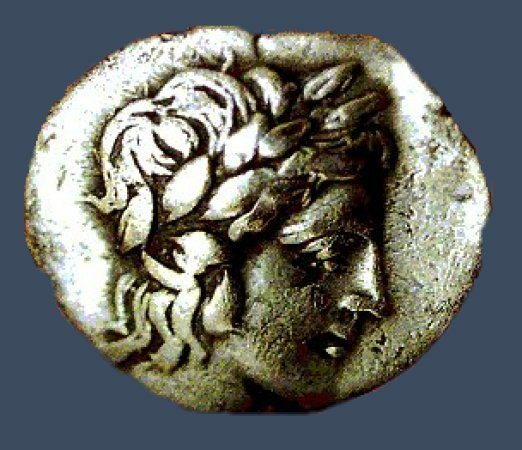 Helike was an important economic, cultural and religious centre, and was the leader of the first Achaean League, a confederation that consisted of 12 cities in the surrounding area. Its patron god of Helike was Poseidon, the Greek god of the sea and earthquakes. This is both predictable and ironic, since it sat smack dab in one of the most active earthquake zones in Europe, and was destroyed by one. 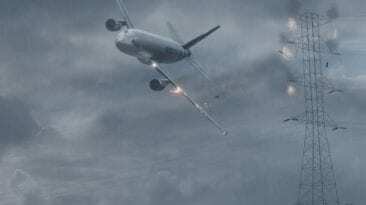 In 373 BCE a huge tsunami from the Gulf of Corinth resulting from an earthquake, wiped the city of Helike from the face of the earth. But it wasn’t wiped completely away, nor was it buried that deep under the sea. The city once bragged a giant bronze statue of Poseidon, and 150 years after its destruction a visitor to the site wrote about how it kept getting tangled in fishing nets. Other visitors wrote that the walls of the ancient city were still visible under water, though they were by then much corroded by the salt water. The ancient Romans were also fond of sailing over the site, as they could admire the city’s statuary. The one thing these ancient visitors never wrote, however, was the exact location, and so Helike was lost until very recently. 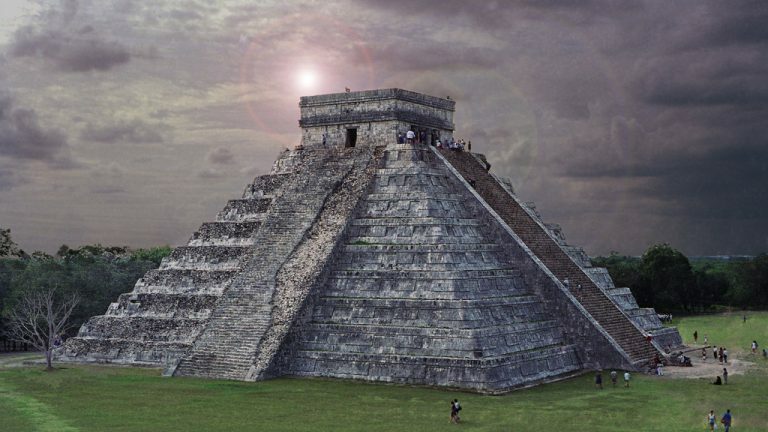 Several of the great lost cities were found in Central America, where the great Mesoamerican civilizations flourished. The Aztec, Inca, Olmec, Toltec, and Maya people built fantastic cities of stone within the jungles, with towering pyramids and complex infrastructure, but in the 16th Century they all came to an end when the Spanish Conquistadors waged their wars of conquest on the Americas. The big cities were abandoned as the people had a better chance of survival in small towns. 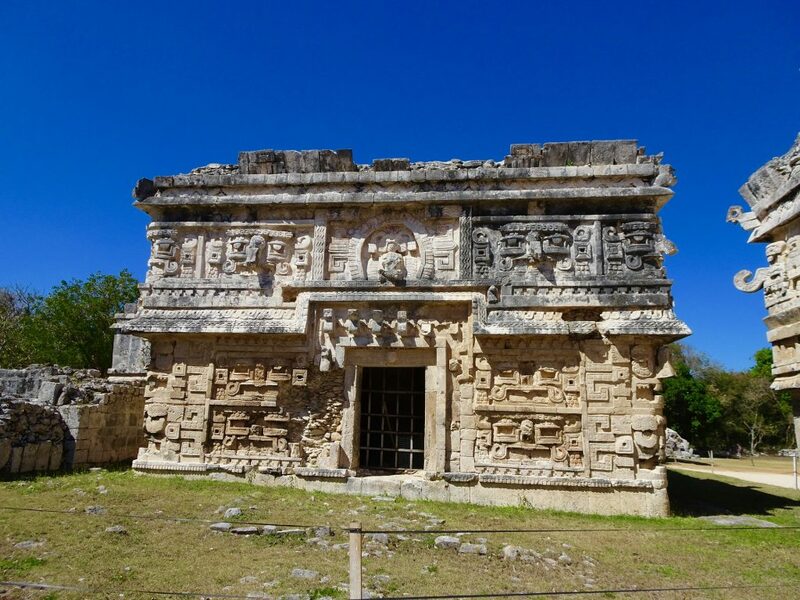 In the Yucatan peninsula of Mexico, the Mayan culture made their mark. 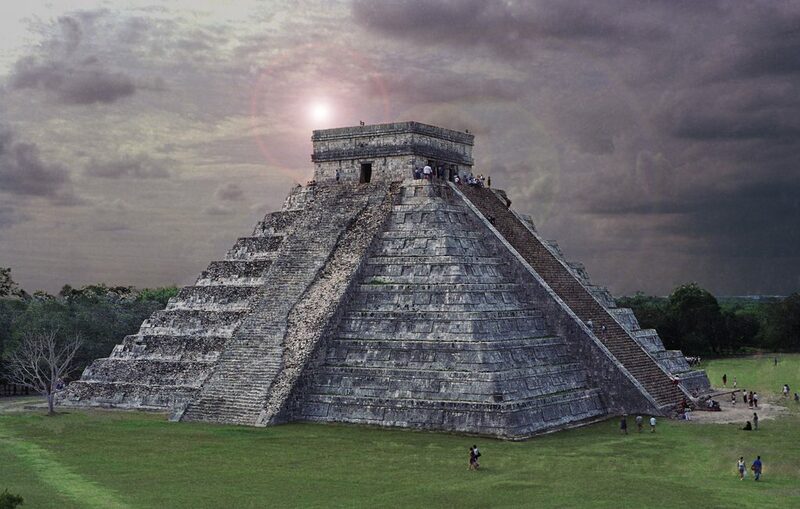 In the 6th Century they built Chicne Itza not far from modern day Cancun. They built it beside two major cenotes, which are wells found in natural sinkholes in the limestone ground, and the only source of fresh water in the area. The name comes from the words chi (“mouths”), chen(“wells”), and Itzá, the name of the Maya tribe that settled there. Around the 10th Century the Mayan cities in the area fell, and were occupied by foreign invaders. Although these invaders still spoke Mayan, they brought in new influences from the Toltecs. They may habe been the Itza people, or the Itza may have arrived a few centuries later. In any event, it was at this time that some of the more remarkable architecture was built, including the so -called Castle, a pyramid with 265 steps rising to the top, one for each day of the year. During the solar equinoxes, the setting sun creates the shadow of a snake — perhaps meant to be the God Kukulcan — winding down the steps. 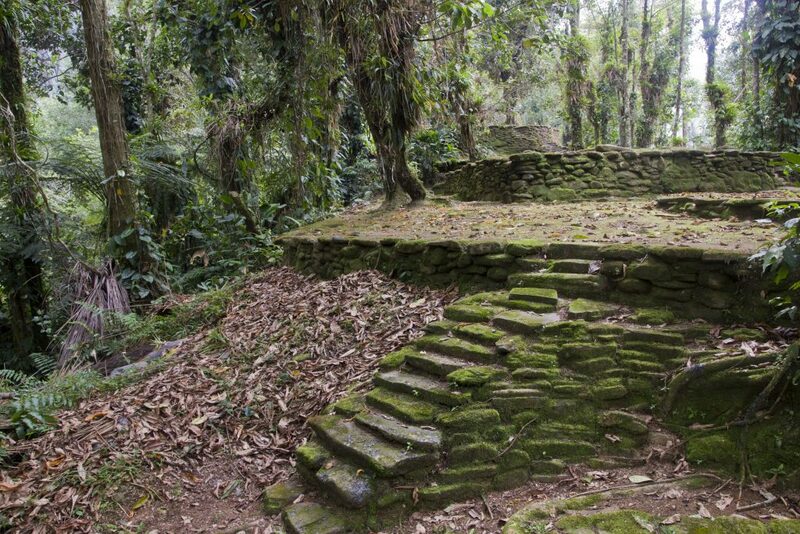 After the city was abandoned it was swallowed by the jungle and forgotten by all except the surviving Maya, who still lived in the area and revered the site as sacred. 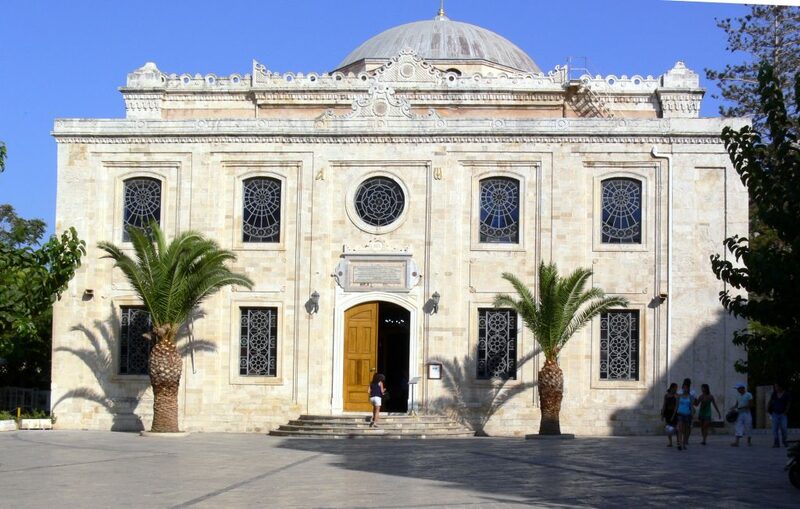 In the 19th Century, the place was rediscovered by the outside world and archeological restoration began. Today it is a major tourist attraction, with countless daytrips to the site offered by the bevy of resorts along the nearby Mayan Riviera. 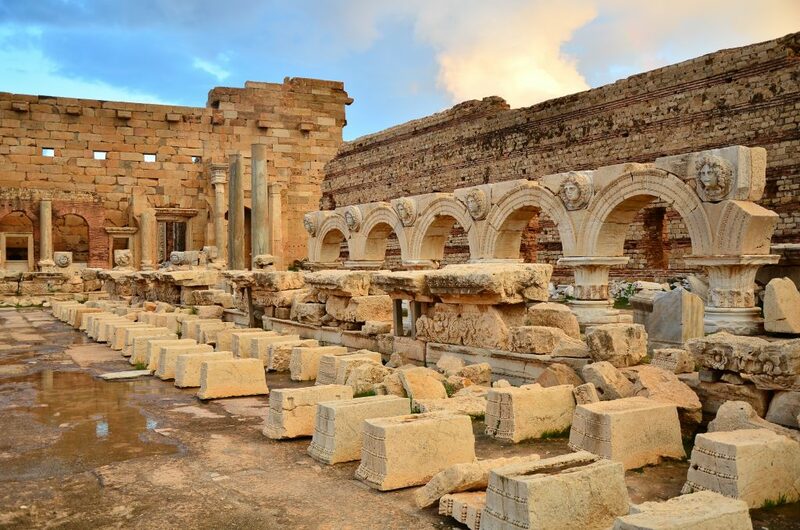 Only 100 km (62 miles) southeast of Tripoli on the Libyan coast of the Mediterranean, a once-great city laid buried in the sand for almost 1500 years. 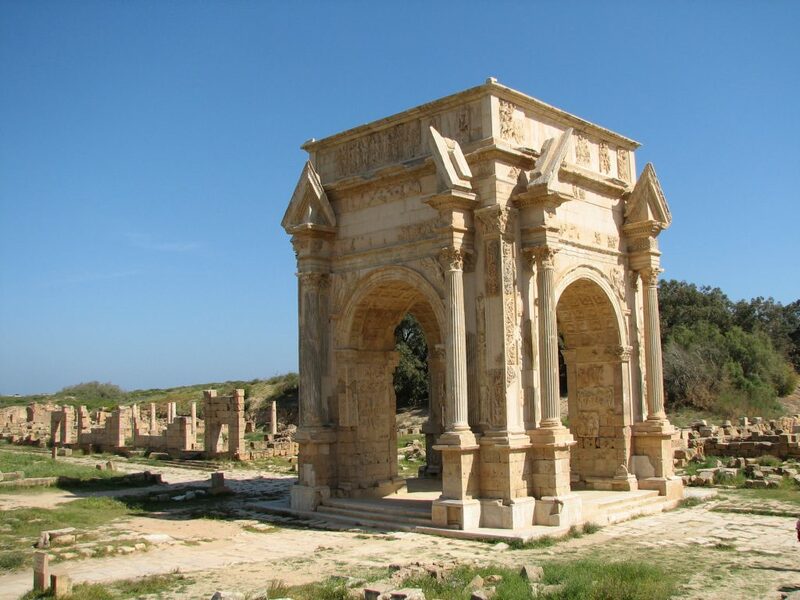 Leptis Magna, as it was known in Roman times, was originally founded by the Phoenicians around 750 BCE, but fell into the hands of the Carthaginians a few hundred years later, then ultimately became a Roman colony. Its natural harbor was improved many times, and the Roman Emperor Septimius Severus was even born there. In 642 it was conquered by the Arabs and quickly fell into ruin, only to be consumed by the desert and presumed lost forever. 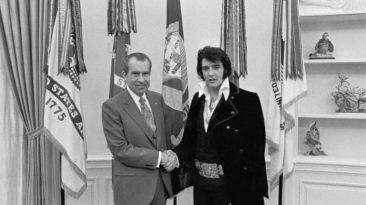 But as Prince said forever is a mighty long time, and it was rediscovered in modern times. 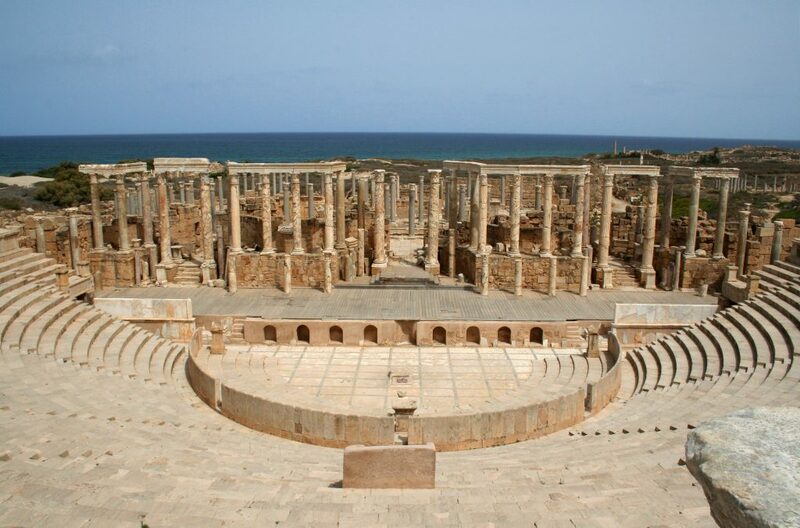 It was incredibly well preserved under the sand, and is today one of the finest examples of a Roman city in the world. It has everything you would hope and expect to find in an important Roman city: an amphitheater, forum, baths, a circus, beautiful colonnaded streets, fountains, aqueducts, and a grand basilica. They call it the 8th wonder of the world. Perched on top of a near-inaccessible cliff in Sri Lanka, the ancient palace and fortress of Sigiriya is pretty cool. The ancient Indian epic poem describes a place called Alakamandava (the City of the Gods) that was built 5000 years ago . It actually describes a lot of places, but some believe that this particular place is a reference to the incredible castle of Sigiriya on its 200 metre (650 foot) tall boulder. Archaological evidence does show that human beings lived in the area 5 millennia ago, during the Mesolithic period. It is unknown what was first built atop the boulder or when, but the current structures were only made there in the late 5th Century. 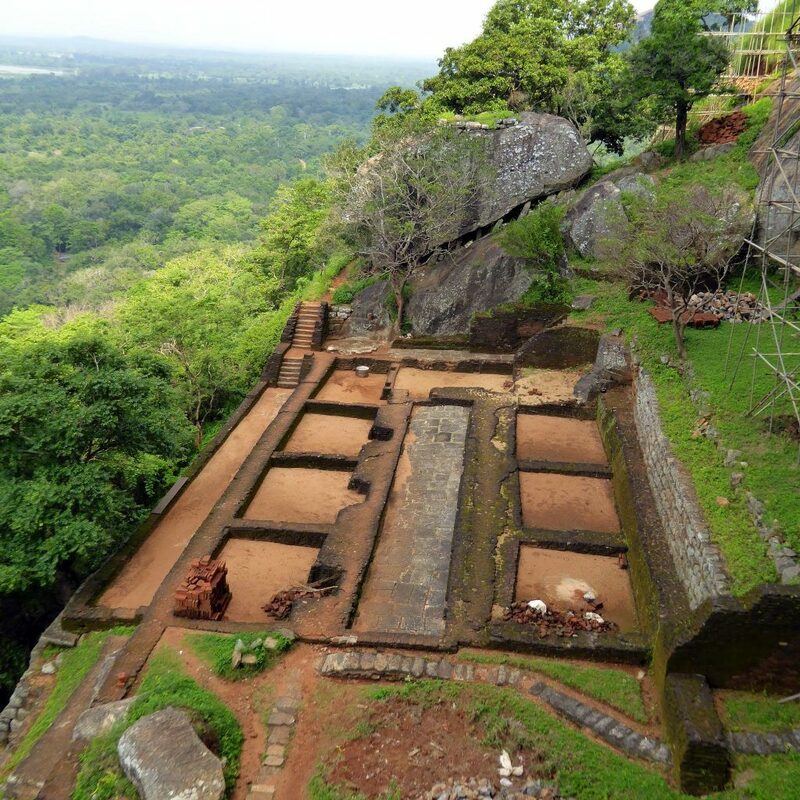 Shortly after, the King who built it was defeated by a rival, and the fortress of Sigiriya fell into the hands of Buddhist monks, then fell into disuse during the Middle Ages. It was “discovered” by a British soldier in 1831. He may have been attracted by the giant frescoes covering the entire western face of the rock, which was staggering in itself. But what he found on top of the rock defies imagination. 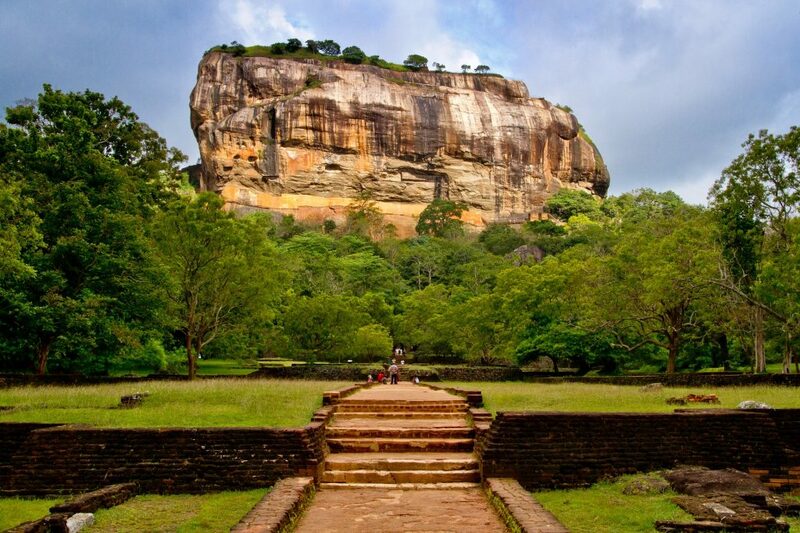 Sigiriya consists of an ancient citadel with the ruins of an upper palace located on the flat top of the rock, a mid-level terrace, and the lower palaces located behind lavish gardens, along with protective moats and ramparts. 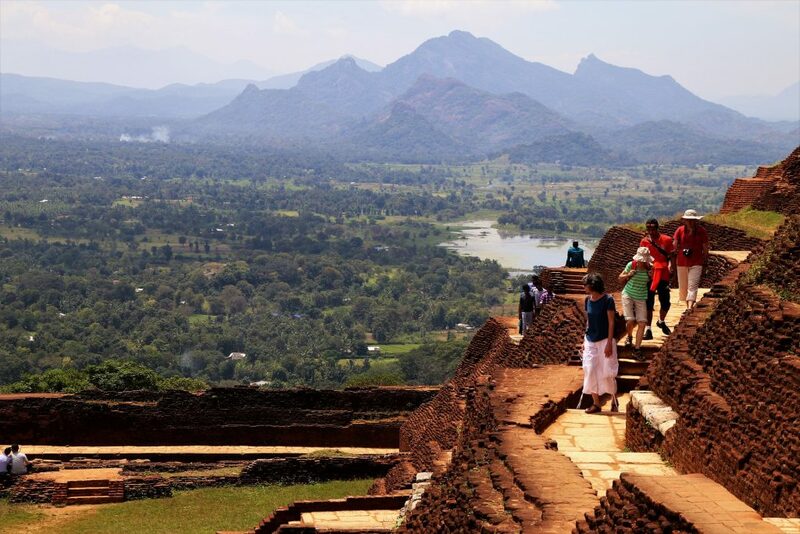 The site is the most visited tourist attraction on Sri Lanka today, but this isn’t new; it has been a popular destination for many hundreds of years. One of the castle’s features was the Mirror Wall, a stone wall covered in plaster polished to a reflective sheen. Over the years, tourists have written graffiti on the wall. One such scribble dating back to the 8th Century says that the writer came with hundreds of people to see Sigiriya. This place’s name literally means “Lost City,” but it has had other names as well. The grave-robbing treasure hunters who found it in the 1970s called it “Green Hell” or “Wide Set,” and the locals (who naturally had known about it all along) called it Teyuna and believe it was the heart of a network of villages inhabited by their forebears. 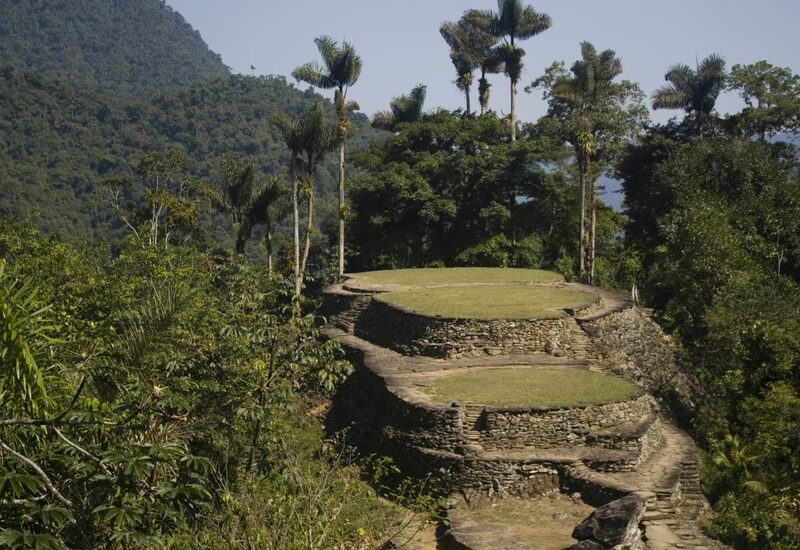 The lost city was built in the Sierra Nevada de Santa Marta mountains of Colombia around the year 800, and its size and location suggests it was the region’s political and manufacturing center on the Buritaca River. 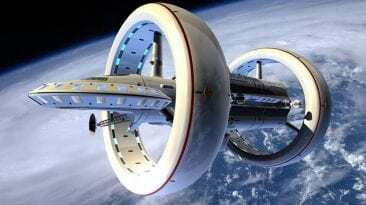 It could have had a population of between 2,000 and 8,000 people. Like many Mesoamerican cities, it was abandoned during the Spanish conquest. The site itself is built on a series of 169 terraces carved into the mountainside, with a network of tiled roads and several small circular plazas. The entrance can only be accessed by a climb up some 1,200 stone steps through dense jungle. It’s one of the largest pre-Columbian towns discovered in the Americas, and the focus of Colombia’s most popular multiday hike. The legend of Heracleion is a tantalizing one. It’s the place where Hercules first stepped foot in Africa. It’s where Helen of Sparta escaped with her abductor-lover Paris of Troy. At one point, it was ancient Egypt’s most important port into the Mediterranean. And in the 8th Century it sank into the sea and was all but forgotten. It appeared in a few rare inscriptions and texts — the Egyptians called it Thonis — and many questioned it ever existed. That is, until the year 2000, when the remains of the city were found at the bottom of the Abu Qir Bay, not far from Alexandria. At its height, the city was criss-crossed by a network of canals and dotted with harbours, wharves, temples and tower-houses – all joined together by a network of ferries, bridges, and pontoons — bustling centre of trade controlled most of the maritime traffic coming into Egypt from the Mediterranean. Among the underwater ruins were 64 ships, 700 anchors, gold coins, 5 metre (16 foot) tall statues, and a massive temple to the god Amun-Gereb filled with the tiny sarcophagi for the animals that were brought there as offerings. And there is still 95% of the city’s area left to uncover from the silt at the bottom of the bay. 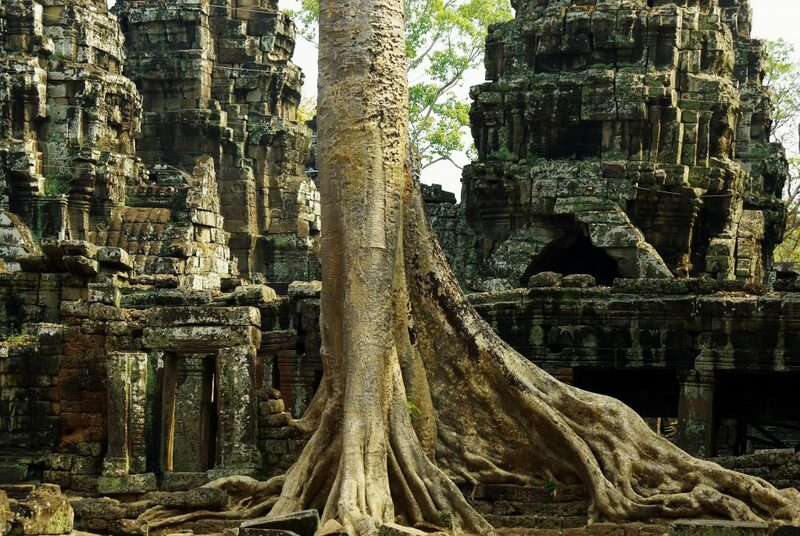 The lost city of Angkor was never really lost, just an understanding of how vast it once was. 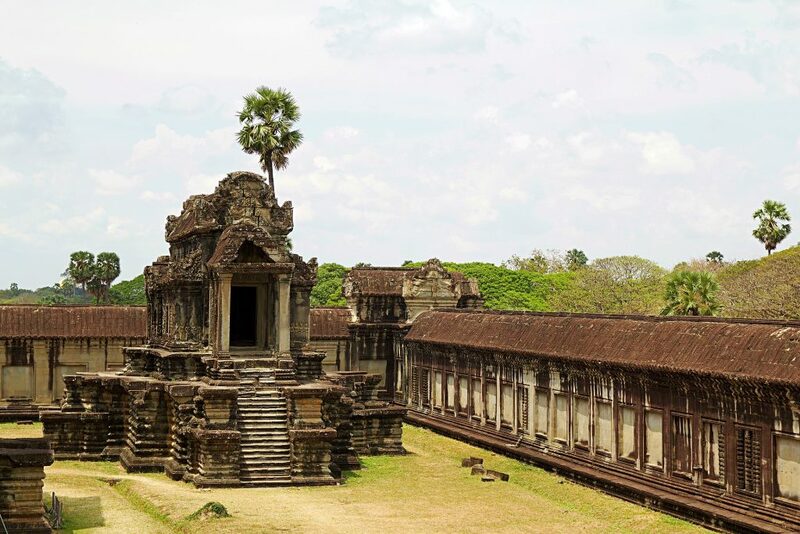 It was the largest pre-industrial city in the world, with an urban sprawl of around 1000 square kilometers (390 sq mi) centered around a complex of over 1000 temples ranging in size from small piles of bricks to the massive and imposing Angkor Wat. 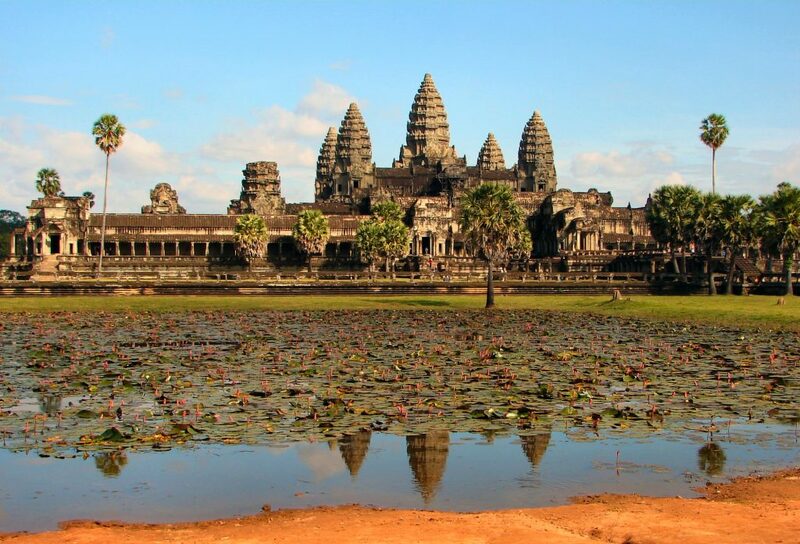 Located in Cambodia, it was the capital of the Khmer empire from the 9th to the 15th Centuries. The city of Angkor the center of one of the largest, most prosperous, and most sophisticated kingdoms ever. 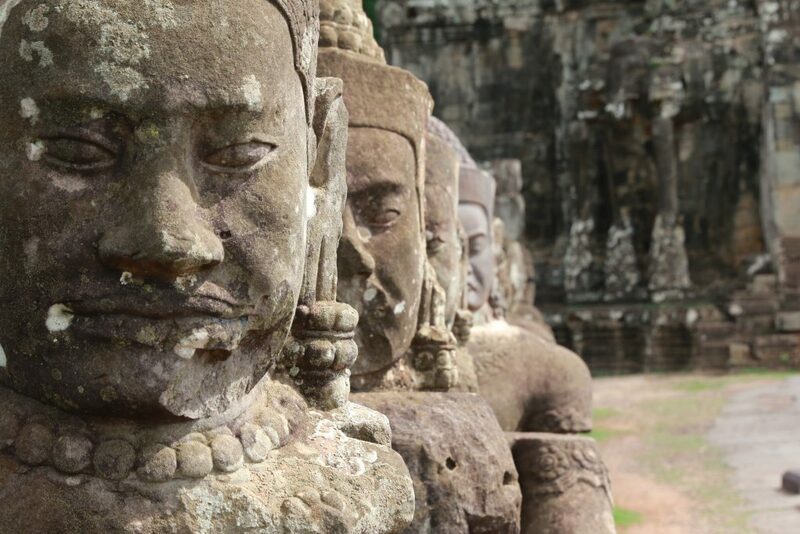 The kings of Angkor ruled over a territory that extended from the tip of the Indochinese Peninsula northward to modern Yunnan province, China, and from Vietnam westward toward the Bay of Bengal. Then the city was captured and sacked 1431, and Angkor was partially abandoned. Evens still, for a while Angkor remained a large, thriving metropolis and one of the most magnificent capitals in all Asia, but it was on its decline. By the 16th century, the city was properly abandoned, and all that remained were the jungle-covered remnants of the ancient temples and the ruins of the once-magnificent system of reservoirs and waterways. Since then, Angkor Wat has been the main draw of the place, occupied and restored by Buddhist monks and turned into a pilgrimage site. Interest in the larger “forgotten” city has always been there, and in the 20th Century a concerted effort was made to map, restore, and preserve as much of Angkor as possible. In 1911 an explorer named Hiram Bingham from Yale University was in deepest Peru, searching for Vilcabamba, the lost city of if Inca where the last of those people fought against the Conquistadors. 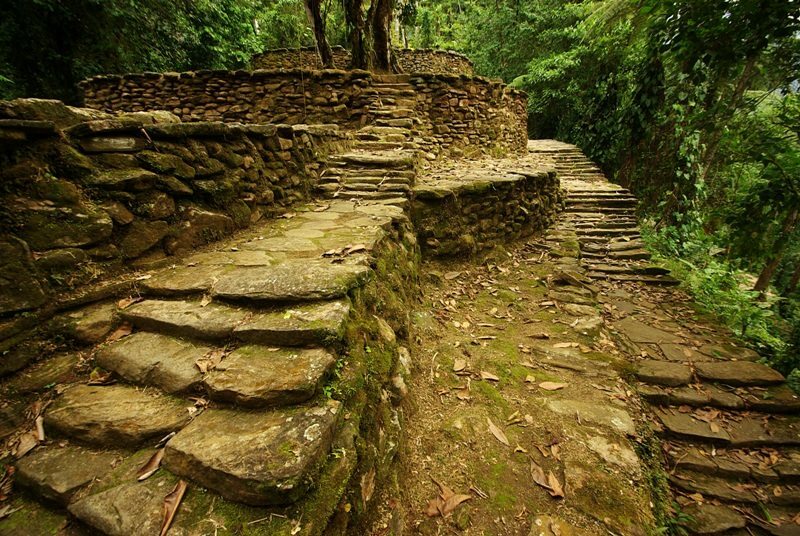 He suspected Vilcabamba might also be the mythical Tampu-tocco, birthplace of the Inca peoples. He found a lost city alright, but it was the wrong one. He’d found Machu Picchu instead. 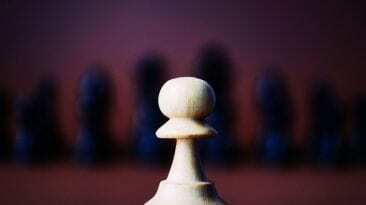 It took over 50 years for the case of mistaken identity to be solved, not until 1964 when another adventurer proved that a different site was Vilcambamba. Ironically, Bingham had found these ruins too, but they seemed too small to be what he was looking for so he passed them by. What he had found was one of the most amazing places on earth. It was a small city perched atop a mountain, big enough to house around 500 to 750 people, and nobody had ever heard of it. It was undiscovered by the Conquistadors, which was awesome, because that meant it wasn’t defiled by them either. 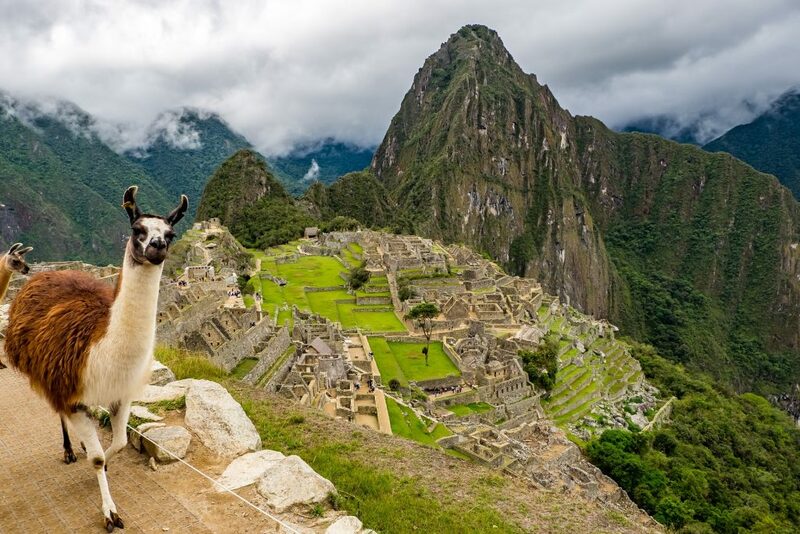 One of the more popular theories is that Machu Picchu was a retreat for the wealthy and important Incans who wanted a place to get away from the hustle and bustle of the big city. 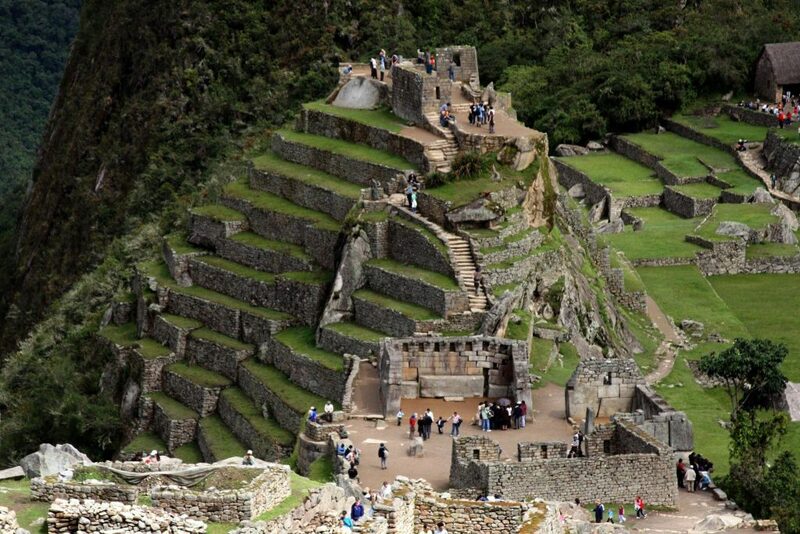 It’s really more of an estate than a city, because Inca cities were freaking huge. 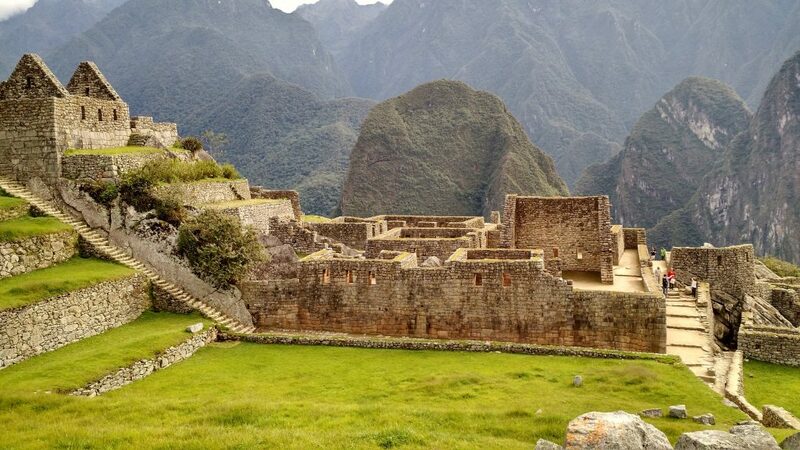 It was only in use by the Inca for about a hundred years, they built it around 1450, and in 1572 the last Inca ruler was killed by the Spanish. 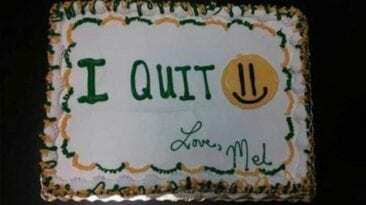 In truth. Hiram Bingham wasn’t the first westerner to set foot in Machu Picchu. While the jungle had overgrown the site and hidden it, the locals did know about it. There is evidence that the place was discovered and plundered in 1867 by a German businessman, and that a German engineer had arrived even earlier. Maps show references to Machu Picchu as early as 1874.